212 low fat curds recipes | low fat Indian curds recipe collection. Curd has a special place on the plate and palate of India. No Indian meal is complete without some form of dahi showing up on the table. Sometimes, it is used to make raita, curd rice and other recipes, or it is just enjoyed plain. In whichever form it is consumed, it is one of the favourite foods of people across the country. While we know our low fat dahi by the name of low fat curd, people in other parts of the world usually call it low fat yogurt. Low fat curd has many health benefits from weight loss to being low in carbohydrates. low fat curd basic recipe is easy to make. Learn how to make low fat curds as a base to use for low fat raitas, low fat roits using low fat curds, dals using low fat curds and Indian salad dressings using low fat curds. The key to using low far curds is that it's great for weight loss, diabetics and heart patients. They are not allowed higher levels of fat and low fat curd is the best option for them. Low fat curd used in raitas is a very safe option for those who want to live a healthy life. If you don't exercise often, then follow these low fat raitas. We have healthy raitas options using low fat curds like cooling cucumber raita recipe, lauki phudina ka raita, low calorie spinach raita recipe and mixed veggie raita recipe and flax seed raita recipe. 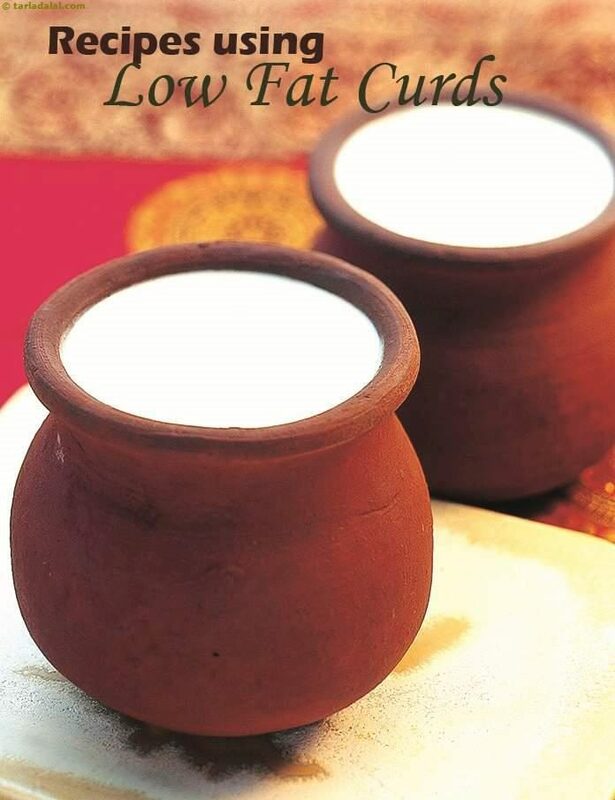 Low fat curd used in Indian Snacks. Muthias are a favourite Gujarati snack and we have made this healthy by using jowar flour, grated cabbage and low fat curds in cabbage jowar muthia recipe. Another healthy snack is moong dal dhokla recipe made with low fat curds and moong dal is a perfect healthy snack. High Fibre Chila recipe is a tasty and time-tested snack, perfect for a snack. It gives a lot of room for innovation too, as you can add your favourite veggies, greens or other ingredients to make it as exciting as you want. Here, these scrumptious pancakes are made using buckwheat, which is extremely high in fibre, calcium and iron. We present you some healthy dal recipes using low fat curds. A lip-smacking preparation of wholesome khatta urad dal, perked up with calcium-rich curds and pungent ginger, garlic pastes. Although it makes use of minimal ingredients, the Khatta Urad Dal has a distinct, tongue-tickling flavour that you are sure to relish. Fatless ma ki dal recipe stays away from high fat butter and cream, and uses low-fat curds to recreate the same rich texture. The Panch Ratani Dal recipe also gets the right amount of tang from low fat curds and tomatoes, which complements the spiciness very well. Rich in folic acid and fibre, this flavourful dal is also good for your heart. Low fat curds used in theplas. Doodhi thepla recipe is a healthy snack to have made with whole wheat flour, doodhi and low fat curds. Low fat curds in Indian Salads just make it a lot healthier. This bulgar wheat salad recipe has a dressing made from low fat curds and garlic paste. Cucumber, Capsicum and Celery Salad, is a delightful combination of fresh vegetables, fruits and low fat curds which makes this salad hard to resist. The low-fat curd dressing is delicately flavoured with basil and mustard powder. The fruits, vegetables and low-fat curds have few calories, but contains a lot of fibre. Low fat Curds : Curds help in digestion as it has very good bacteria. Probiotics in curds acts as a mild laxative but, in case of diarrhoea and dysentery, it is a boon, if curd is used with rice.They help in weight reduction, good for your heart and build immunity. The only difference between curds and low fat curds is the fat level. Read the benefits of curds to include in your daily diet. Enjoy low fat curds recipes | low fat Indian curds recipe collection our below. Suggested serving size for 100 calories: 3 pieces. Get ready for some praise with this no-fuss instant dhokla using the unconventional taste of corn. Ideal low-cal snack for those on the move.